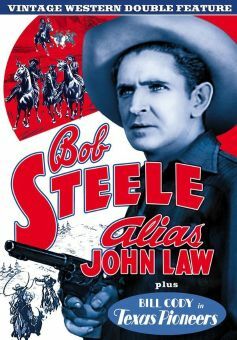 Directed by his father, Robert North Bradbury, Bob Steele's third Western for independent producer A.W. 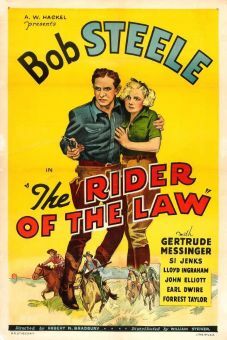 Hackel remains one of the most bizarre and evocative B-Westerns of the 1930s. Written by set designer/supporting actor Perry Murdock, The Big Calibre is really a horror movie masquerading as a Western, complete with a mad, disfigured scientist who kills by employing vials of poison gas. Steele's onscreen father (Frank Brownlee) becomes the Mad Doc's first victim and the sheriff's investigation points to town chemist Otto Zenz as the killer. Before he can be arrested, Zenz escapes with Steele in hot pursuit. (Eerily, director Bradbury favored stories about sons hunting down their fathers' killers.) Along the way, the young cowboy stumbles over a mysterious and unsettling pile of dried-up bones, a stage hold-up that isn't quite what it appears to be, and a girl (Peggy Campbell) whose ranch is threatened by a greedy lawyer (Forrest Taylor). The latter's co-conspirator, the hideously deformed assayer Gadski, may or may not be the missing chemist/killer. Despite all that, Steele manages to revenge his father's death in a final, desperate struggle during which the maniacal killer is undone by his own murder weapon.